Picture yourself in a full-length camouflage paintball suit, moving through the bush with your best friends, finger on the trigger ready to shoot the enemy and bring victory to your team. If that sounds like a fun and exciting day then why not get everyone together for the best party of the year! 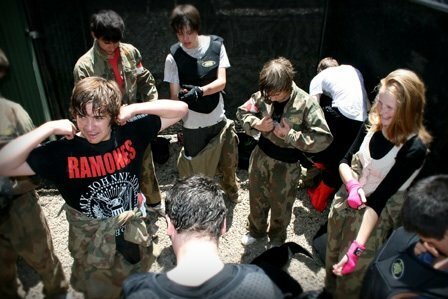 Every weekend Delta Force plays host to countless paintball parties for children and adults of all ages. Our movie-set game zones and incredible safety equipment will ensure that you and your guests will be well looked after. Your safety is our paramount concern and we have taken every initiative possible to ensure this. We have also received a 5-star rating from the Australian Paintball Association (AUPBA)… high praise indeed. 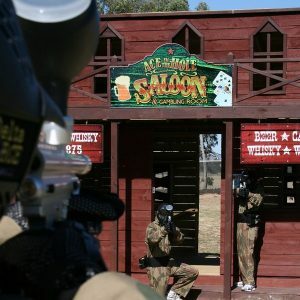 On your full-day paintball adventure you will receive a full-length body suit, full-head protection goggles, body armour to protect the upper torso, an ammunition pack and a 0.68 calibre inferno paintball machine gun. Add this impressive equipment to our world-famous movie-set game zones and you are all set for an action-packed paintball adventure. Experience the best paintball scenarios in the industry, each one filled with their own unique props straight from the movie set. 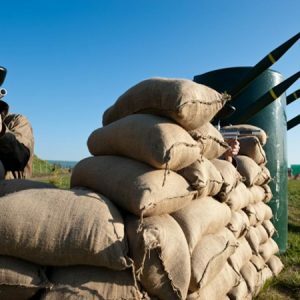 On your paintball experience you may encounter game zones such as Tomb Raider, Tropic Thunder, the Wild West, London After the Apocalypse, Checkpoint Charlie, Jungle Crypt, Dodge City and many more. Click here for more information on each game zone. At Delta Force we ensure each and every birthday party is the ultimate paintball experience – from happy birthday wishes to a special game for the birthday boy or girl, a birthday with Delta Force is always an event to remember. We even have a variety of invitations available to download to mark the special occasion and get everyone in the mood for some action-packed paintballing. Click here to check the minimum age for paintballing in your state. 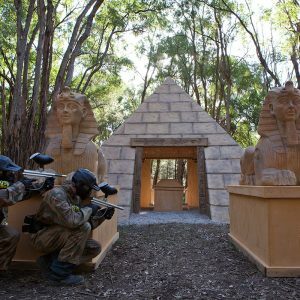 So grab your mates, make a booking and visit any of our centres throughout Australia for your shot at paintball heroism.